When constructing a website for your business, it could end up costing you thousands of dollars if you go with a web designer who plans on making the thing from scratch. Skip this nonsense and select an automotive WordPress theme that you can upload to a WordPress install and launch within just a few minutes. WordPress themes are generally very affordable and come with detailed instructions and documentation so even complete beginners can get a website up and running fairly quickly. Auto companies generally want to have image-based sites, with booking modules and areas to show off promotions. Responsive design is a must for any type of website and the ability to connect with potential buyers through contact forms is another essential feature. Since tons of automotive solutions are scattered throughout the internet, we did the work for you to locate the themes that pack the most punch in terms of reaching out to your customers and remaining relevant in today’s digital age. Keep reading to check out the handy themes that can take your business to the next level. There is something to fuel up the marketing efforts and improve sales. The built-in Google analytics tool allows you to view and gain insights into the user behavior on the central dashboard for intelligent merchandising decisions. 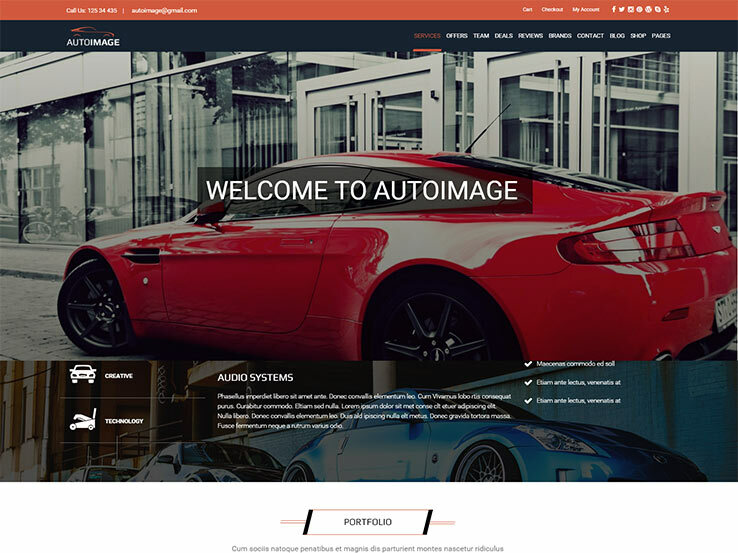 A stunning, responsive automotive WordPress theme excellent for an online vehicle marketplace or an auto motor magazine and blog. 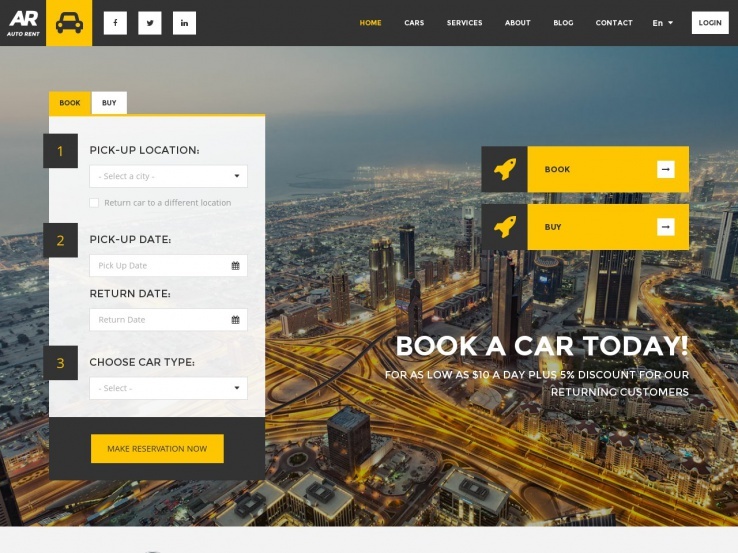 As this theme has been designed with car dealerships and car rentals in mind, it aims to include all the features necessary for creating such a website. Whether you are listing cars for sale or hire online, publishing vehicle reviews, or are just building a website to promote car showroom, AutoTrader is a perfect choice. AutoTrader comes bundled with a range of cool features: advertising ready, “Seller” type user accounts, advanced vehicle search and filters, auto-image resizing, advance sidebars, contact and reservation forms, pricing tables, and much more. Make your business rise with AutoTrader! 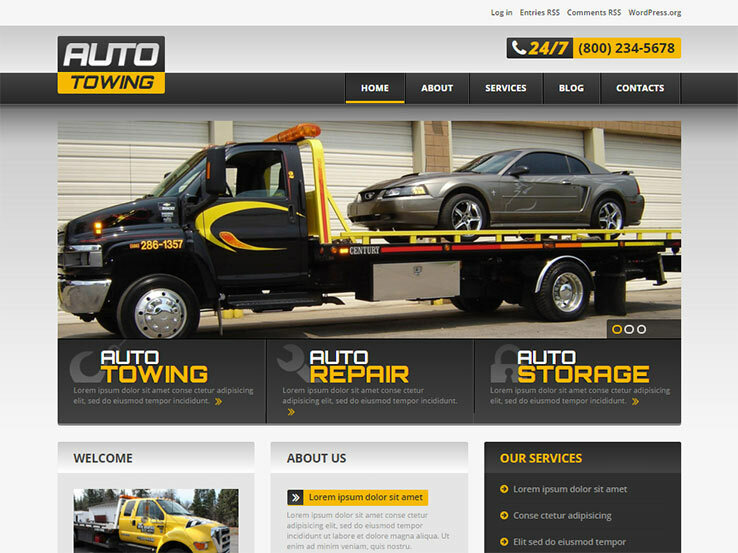 The Auto Towing WordPress theme is designed for car repair services and it has a beautiful responsive layout so your customers using smaller devices can easily see your content. The fully editable front end is controlled from the WordPress dashboard, allowing for lots of custom post types and formats such as galleries, links, quotes, and audio posts. The multilingual nature of the Auto Towing theme means that people who don’t speak your language can understand what you’re saying, while over 80 shortcodes keep your hands free of any source code since you can make items like lists, columns, and buttons within seconds. An advanced backup feature is a bonus for those who don’t want to lose any information and the fantastic sliders make it easy to share the images you have of your car repair service. Choose from over 600 typography options and use the built-in theme customizer to make other design changes. Custom widgets include options for social sharing and comments, while the filterable portfolio is a wonderful way to show off some more pictures of cars and your services. 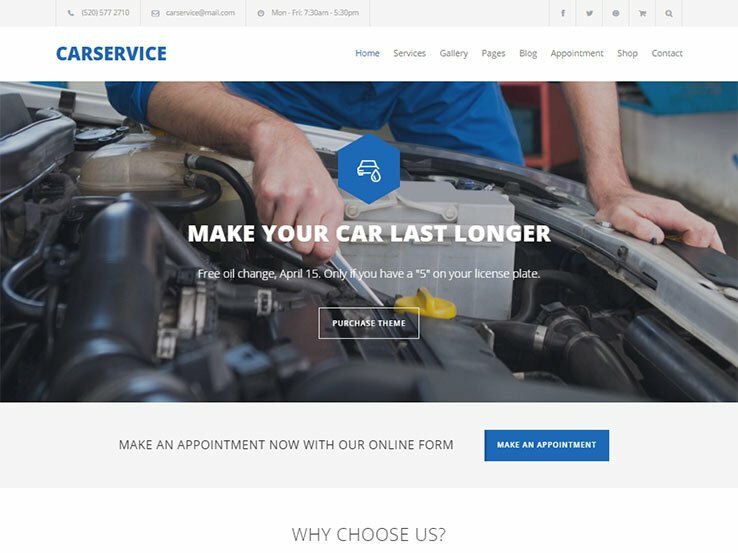 Select from multiple color options to brand your site and feature your auto repair services right below the slider images at the top of your homepage. Some other handy modules provide areas for showing links to your services, About Us information, and a welcome message for newcomers. 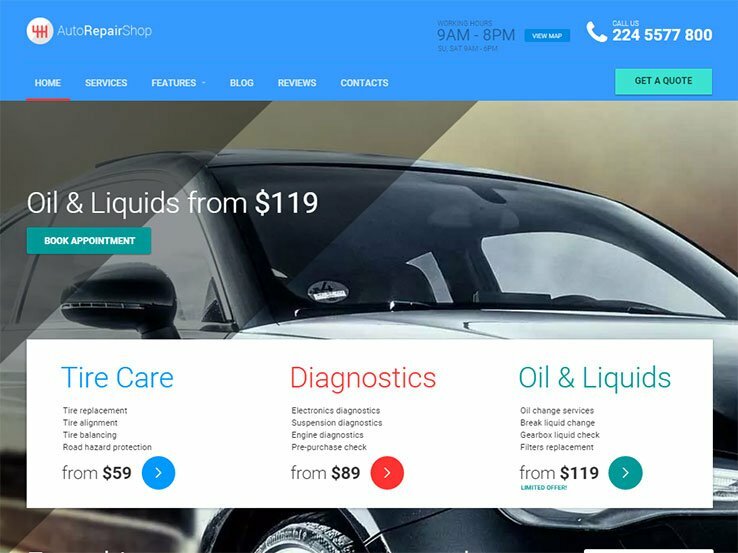 The Car Repair theme comes from TemplateMonster and it has a responsive layout which looks great on mobile devices such as tablets and phones. 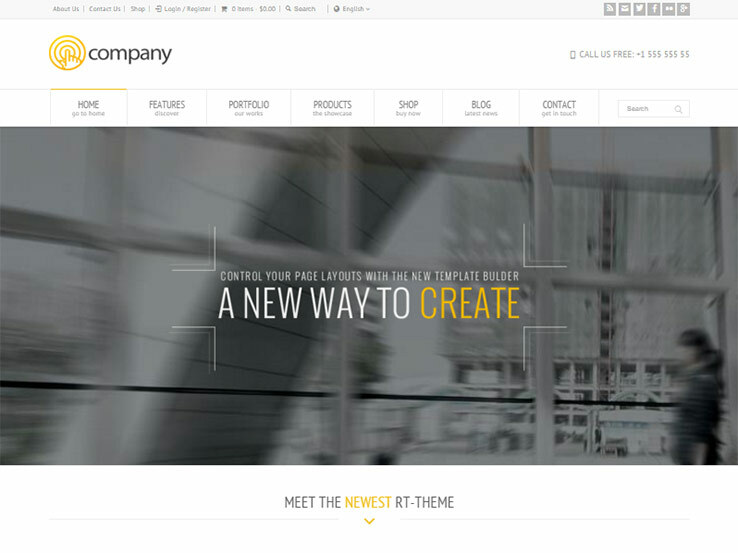 The theme offers a modern design, with beautiful images that highlight your services. Create a page for your services and generate an area to highlight the prices. Testimonials and FAQs are easy to make and the News page is where you’ll share information on your blog, boosting your SEO and sharing content with your customers. Contact information can be shown on a separate page, as well as on the homepage. The Car Repair theme has social media buttons so you can easily encourage people to follow you on Facebook and Twitter. The entire homepage is in a grid-based format, with beautiful images and descriptions. Most of them are links to your Services pages, but you can also include featured images that lead to your blog posts. Some other features include translation files, which are nice for reaching out to foreign customers. The theme also includes various shortcodes for building sliders, buttons, and columns, without the need for advanced development knowledge. 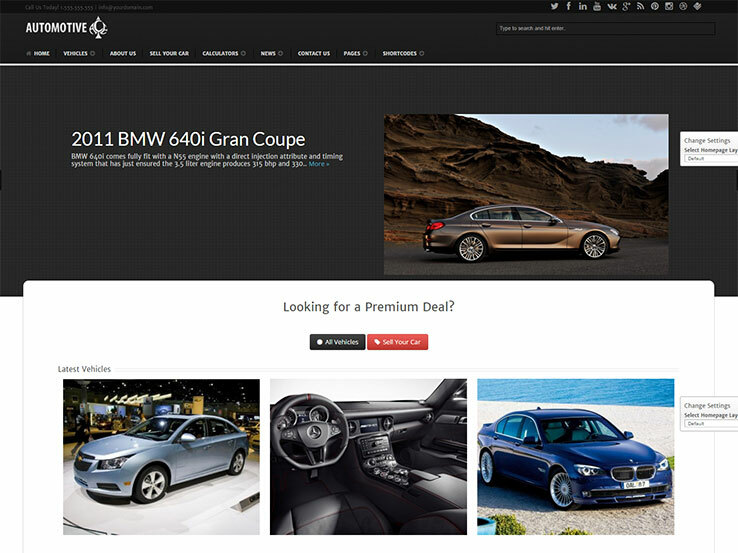 Consider going with the Autodealer WordPress theme if you’re in the business of selling cars, whether they are new or used. This is one of our favorite auto themes since it provides a great search tool that allows customers to search for vehicles based on a model, manufacturer, type, and price. A featured vehicles slider is wonderful for showing off a wide selection of your cars on sale and the responsive layout means that everyone can see your content, regardless of what device they’re using. 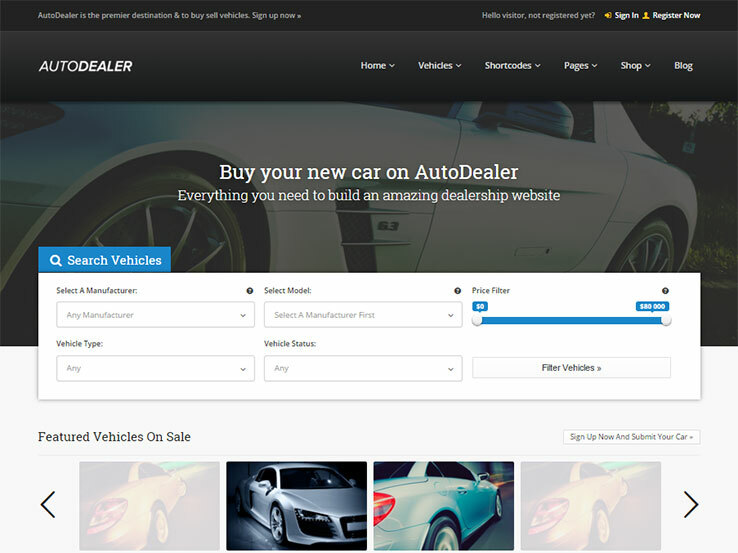 Along with shortcodes for making accordions and buttons, the Autodealer theme allows people to actually submit their own cars to be sold on the site. Not every dealer is going to use this, but it’s nice knowing that the feature is available. As stated before, frontend submissions help with automating the process, but people can also make payments directly through the website if needed thanks to the integration with WooCommerce. When users land on your website they can see a beautiful dashboard for managing the types of cars they want to see. People can favorite some of the cars and come back to them later if they want. 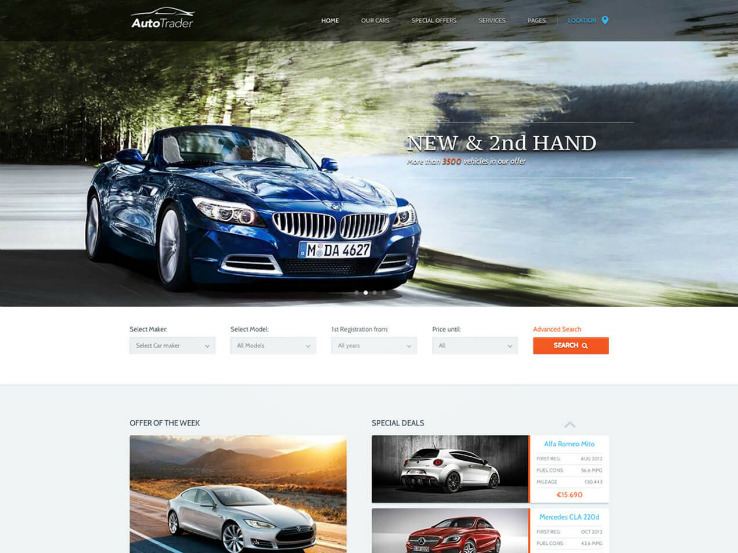 The Automotive Car Dealership Business theme is another way for companies to start selling cars online or offline. It’s ideal for car dealerships because it has an inventory management area that allows you to see which of the cars are still available. The filterable listings are great to improve the user experience, while also showing the search engines that it’s easy to move around your site. The entire inventory is searchable and the responsive layout works wonders on mobile devices. Several plugins come with the Automotive Car Dealership Business theme. This means that you don’t have to pay for them, even though the premium plugins are generally sold separately. One of the plugins is the Revolution Slider plugin, allowing you to share images in a slider format. Implement animations and other fun effects to attract the attention of your website visitors and point them to your sales pages. The Visual Composer plugin is also included, allowing you to design any type of layout without having to know any code. Simply drag and drop different elements where you want them to appear on the page. 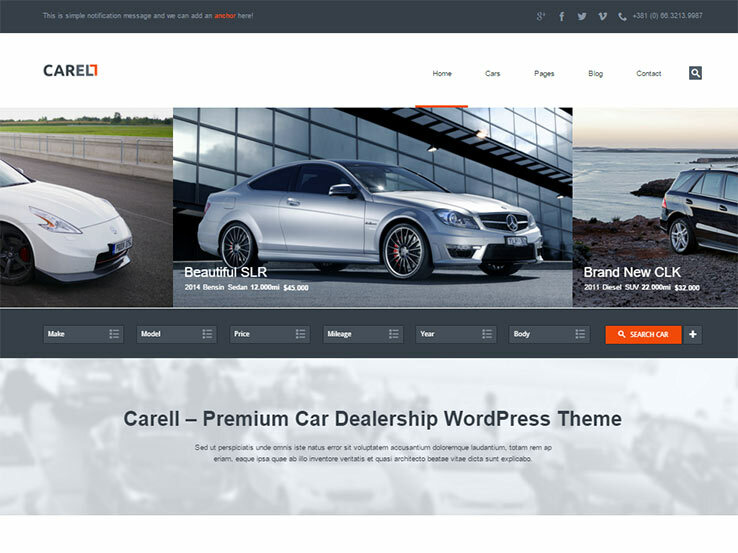 The WP Pro Automotive 2 WordPress theme is a beautiful choice for those who are running car dealerships or rental agencies. The frontend submission system is ideal for those who would like to sell on your website. It’s also not a bad setup for car dealers who are looking to post listings in a quick manner. The powerful custom mapping is a huge bonus, while the backend page builder has a drag-and-drop interface which allows you to create any type of layout even if you have zero coding knowledge. The fully responsive design looks great on smaller devices, making it easier for mobile users to navigate your website. Unlimited custom skins are useful for branding your site. Overall, the customization tools are rather powerful with the WP Pro Automotive 2 theme and each of them are located in convenient locations. Besides the fact that the WP Pro Automotive 2 theme is really easy to customize, it also has several translation files. This means you can reach out to people who don’t speak your language. So, if you have a car dealership in a certain neighborhood with an eclectic mix of nationalities, you can give them the tools they need to buy a car from you. Also, tons of Google Fonts are included with the theme, allowing you to easily customize the typography. WooCommerce combines well with the theme and you can connect the frontend submission system with PayPal. These are just about all the money collection settings you need, so give the WP Pro Automotive 2 theme a try! 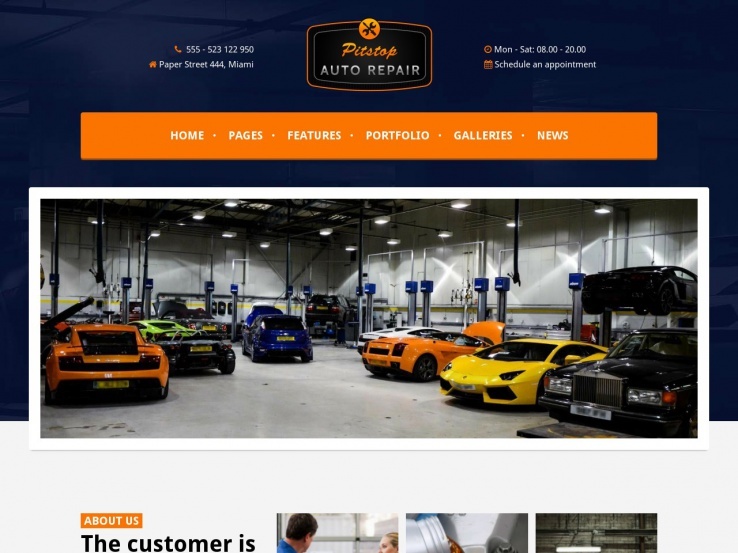 Auto Repair is a theme built exclusively for anyone in the automotive industry with a strong, purpose oriented design that’s sure to land you more customers and clients. The theme comes with several templates and features which include opening hours, a Free Consultation / Appointment Form, Q&A, team members pages, and more. It features a tight integration with Slider Revolution which is a beautiful premium plugin that allows you to create animated slides with text overlays and buttons which are perfect to send visitors to your sales pages. You can create any type of layout thanks to the feature rich page builder so you can easily showcase a gallery of all the cars you fixed, include information on your services, and feature testimonials from happy customers. Easily add a shop with WooCommerce to sell additional car related items and rest assured your website will look great on any device. Use the blog page to publish content related to car care and maintenance. Extensive customization options allow you to brand your site easily and you can also add your contact details along with a Google Map so anyone in need of a mechanic can easily find your location. 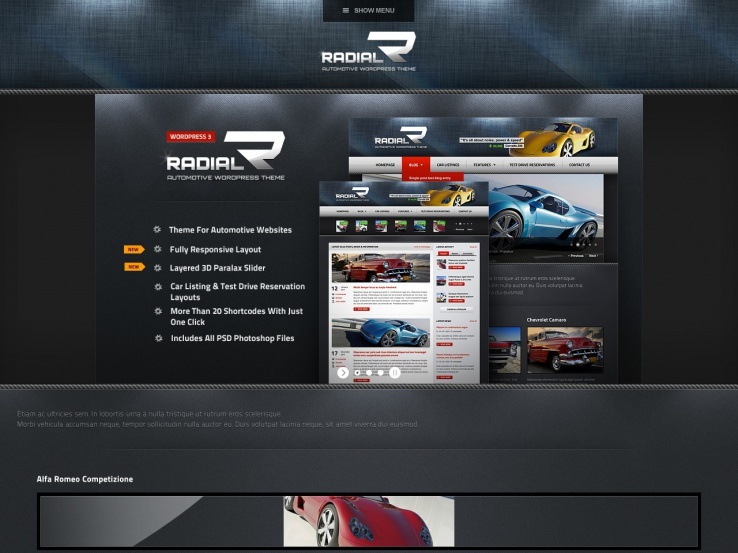 Radial is a stunning theme created with rental agencies in mind. 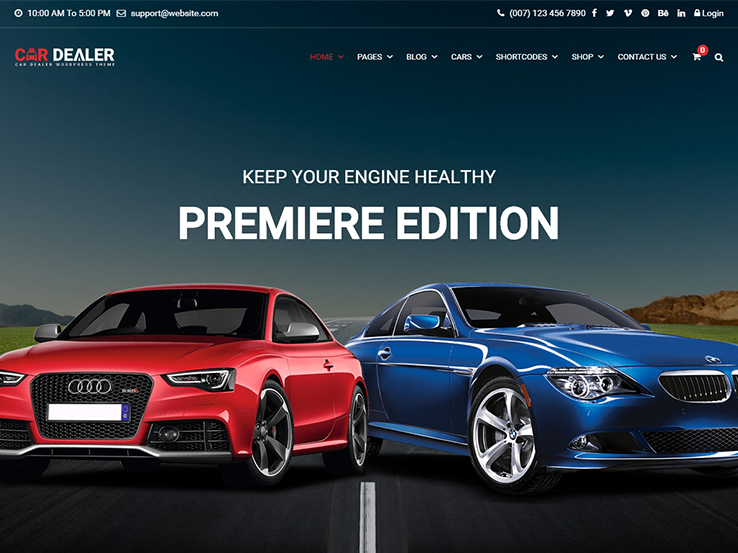 It has a dark color scheme which allows your car galleries to pop and a stunning header slider features your best cars along with text overlays that highlight the car’s features. Present your cars in a beautiful grid layout with thumbnails and buttons that lead to more information about a particular car. Make it easy for your visitors to book a test drive with a special page template created just for that purpose and use shortcodes to add buttons, columns, lists, and more without the need to learn the code. The theme is responsive so even visitors on mobile devices will be able to see what you have to offer and the theme’s control panel allows you to tweak any aspect of your website. Several custom widgets are available so you can easily add extra information to your sidebar or your footer. 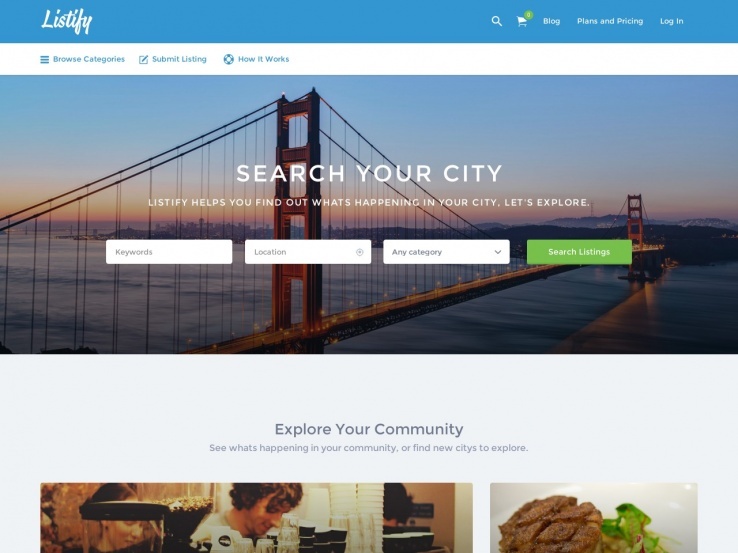 The theme also includes translation files so you can target an international audience and tourists who often need to rent cars but don’t speak English fluently. Along with an adjustable homepage and several gallery styles, Radial has everything you need for your rental agency website. 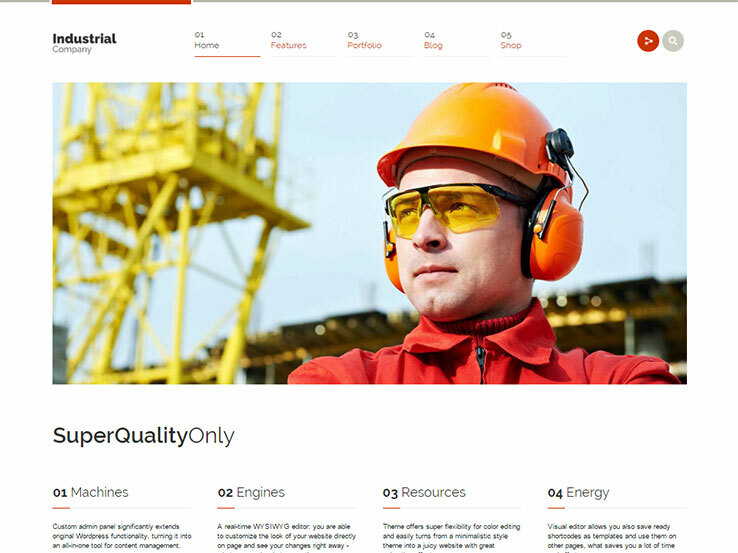 Pitstop will impress your visitors with its bright colors and strategic use of white space throughout the design. The customizable header offers several logo placements choices, while the footer can be styled as well. You can add an unlimited number of testimonials and team members to the site. The attractive HTML5, CSS3 animations, and parallax sections will help you make the regular content look exciting. As Pitstop is fully integrated with WooCommerce, it is possible to manage various premium services and accept payments right on your site. Customers can use the AJAX-powered contact form to get in touch with you. 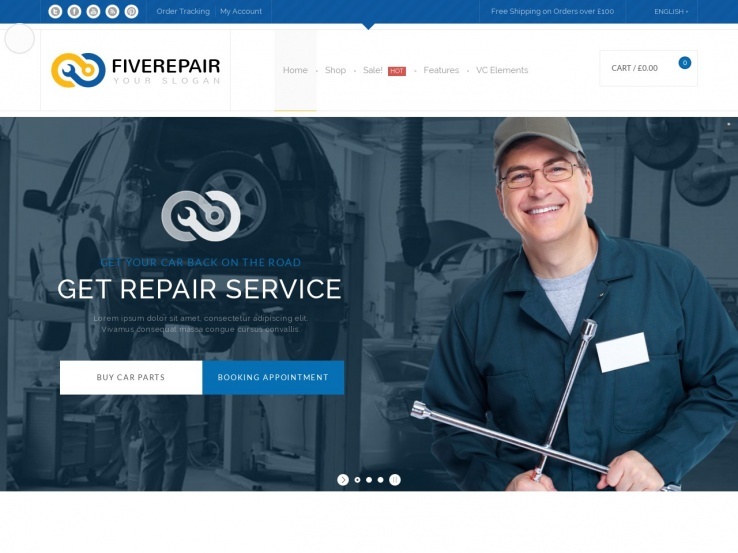 This fully featured car repair, mechanic, and workshop template can be used to develop both one-page or multi-page sites. It allows you to create unique layouts by using the drag-and-drop builder and the distinctive styling for each page. Multiple slider options and the built-in animations will make your website look appealing. Dedicated support for Events Calendar Pro, form builder tool, and WooCommerce will enable you to set up and manage events, contact form, and premium services. There are more than 99 custom shortcodes to add various elements to the posts and pages. 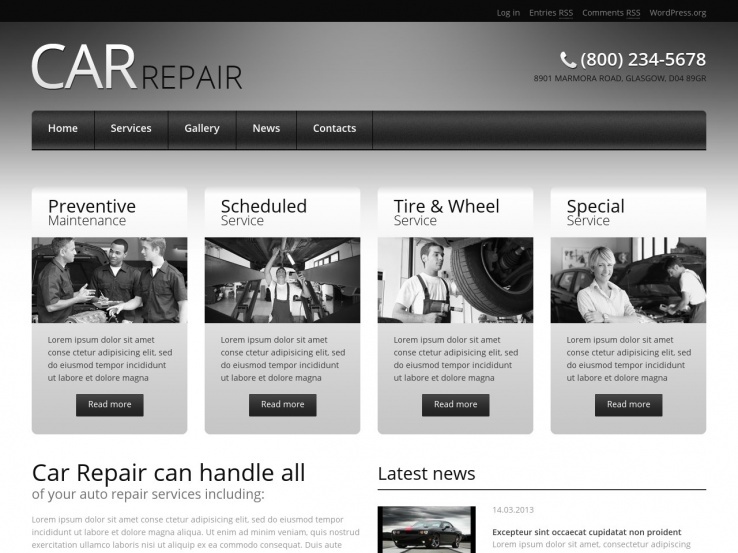 The elegant black-and-white color scheme of Car Retro will make your auto repair website stand out from the competition. Its simple two-step installation will let you get started quickly, while the special post types will complement the regular blog posts. Feel free to use the amazing sliders to showcase your services in different ways. Car Retro’s filterable portfolio makes it a lot easier for the customers to check out your previous works. There are 80+ shortcodes and several custom widgets to help you decorate the regular web pages. With complete support for 600+ Google Fonts, you won’t have to worry about the typography aspect either. Thanks to its simple, minimal design, WP Pro Automotive offers an incredibly fast loading speed for your car and automotive site. Use the drag-and-drop home page builder to choose which sections you want for the front page. Multiple menu locations will ensure that the visitors can easily navigate to other parts of the website. The theme package includes 50+ background patterns along with the option to choose unlimited color skins. Lots of shortcodes and 17 new widgets will come in handy to build unique content layouts. The AJAX-powered options panel provides one-stop access to all the styling options. The professional home page of Car Service displays all the necessary information your customers will expect. Its touch-supported slider and carousel will allow both the regular and mobile audience to check out your amazing automobile collection. The AJAX-powered contact and appointment forms offer easy ways to reach you. Enable the sticky menu to provide your visitors with instant access to the necessary navigation links. There are 12 ready-made designs to help you create the basic website pages. Head towards the customizer section to explore all the personalization possibilities. When using Car Dealer, you have three home page styles to show off your amazing automotive collection. Both the users and dealers can register and get dedicated profiles on your site. Advanced filtering, comparison, and watch list will make it easier for the customers to choose their preferred vehicle. The theme also has separate databases for the car makers and origin countries. Enable the loan calculator so that the prospective clients can get a rough estimate. With complete PayPal support and integrated currency converter, you are all set for displaying and accepting payments too. 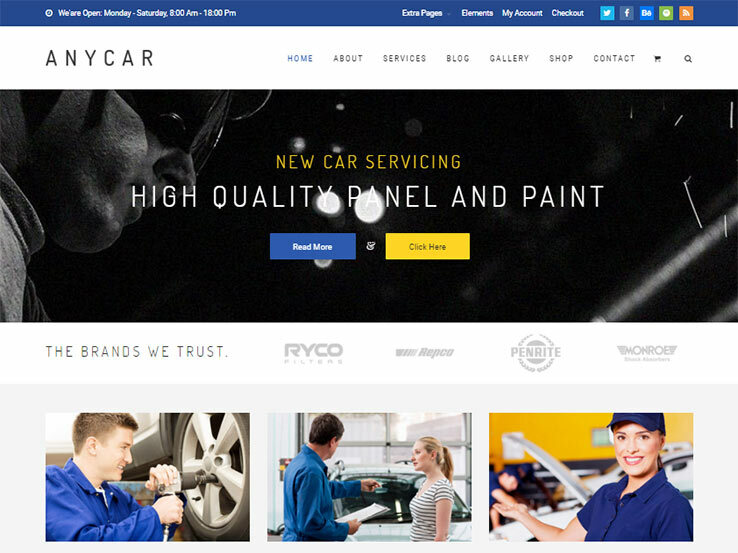 AnyCar will help you achieve the rare combination of elegant design and excellent user experience on your auto dealership and repair website. Feel free to explore the 8+ home page structures and choose the one that suits your requirements. You will also find several professional layouts for the header, image gallery, and blog page. The simple one-click installation will allow you to get started quickly. With complete WooCommerce support, AnyCar makes it possible to offer various auto services and receive payments. The customizer section holds all the styling choices you need. 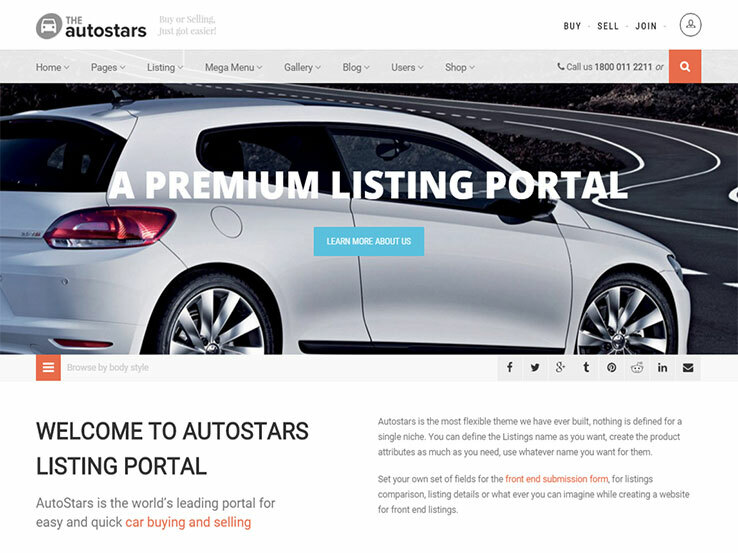 The multi-purpose Auto Stars theme can be used to build great looking auto dealership or car listing websites. Three home page variations and four header styles will enable you to bring a unique look to your site. Visitors can use the front-end submission feature by choosing any of the available membership plans. Auto Stars uses lots of custom badges, specifications, and attributes to enhance the product pages and generate automatic listing titles. The interested audience can use various filters to search for their desired vehicle, enjoy side-by-side listing comparison, and check out the saved, searched, and recently viewed listings. 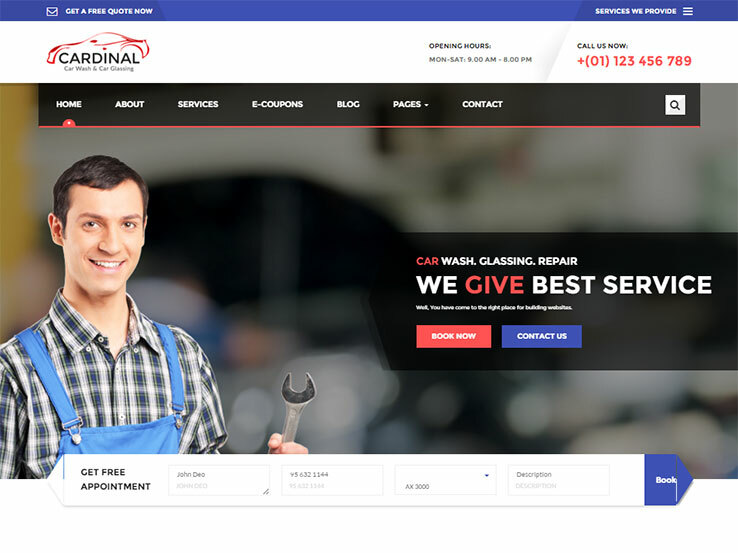 Car Dinal uses a lot of white space throughout the design, thereby making it a pleasure for the customers to browse your car wash and repairing site. The powerful combination of Visual Composer and Revolution Slider will let you create any post and page layout you want. It is possible to enhance the look by applying any of the 30+ shortcodes or the built-in CSS3 effects and animations. The template also comes with several page variations and an unlimited number of sidebars. You will find all the personalization choices in the advanced options panel. Auto Rent puts a car booking form right above the fold, making it a lot easier for your customers to book or buy a car instantly. The drag-and-drop home page sections can be re-positioned in any way you prefer, while the latest arrivals can be highlighted by adding these to the featured items section. Visitors can search and filter the available collection, and express their opinions by using the rating and review sections. Thanks to the internal messaging system, they can send personal messages to each other. The WooCommerce-supported template also enables you to customizable the email notifications for various events. 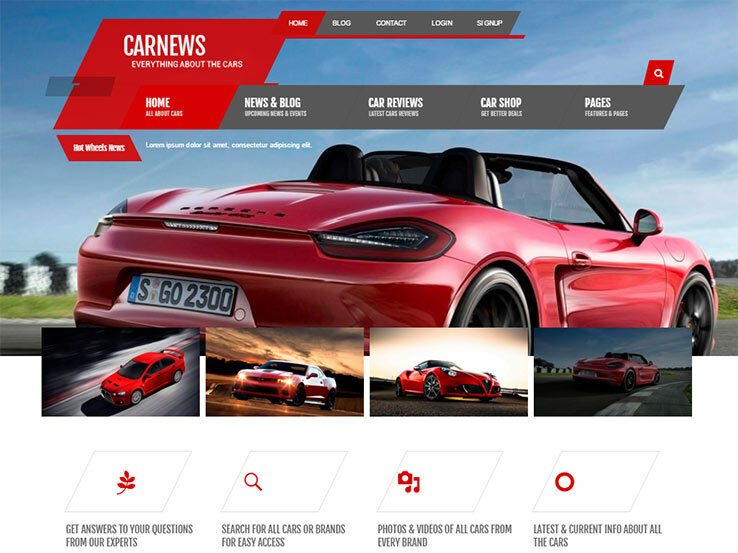 While most other themes listed in this post are focused on building car repair, listing, and dealership sites, this one is all about creating a car news, blog, and review site. Show the latest updates in the news ticker, and use the readily available shortcodes, widgets, and FontAwesome icons to decorate the website. Built-in polls and voting sections will let you collect feedbacks, while native MailChimp integration will enrich your email list. Other premium goodies like related posts, author box, Flickr photo gallery, and the advanced search form have made Car News a trendy choice. 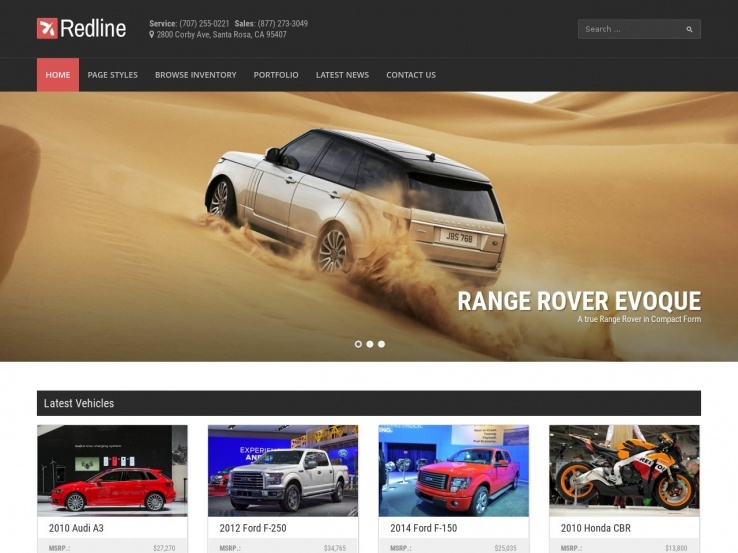 Redline’s simple, traditional design will allow you to put together a car dealership site within a short period. It gets the full set of dealership options to help the potential clients find out the exact type of vehicle they are looking for. The simple styling choices will come in handy for choosing custom colors, backgrounds, and making other visual changes. As the template is based on HTML5 boilerplate, rest assured that your website will deliver exceptional performance on all devices. Refer to the video tutorials to find out step-by-step instructions for using the various available features. 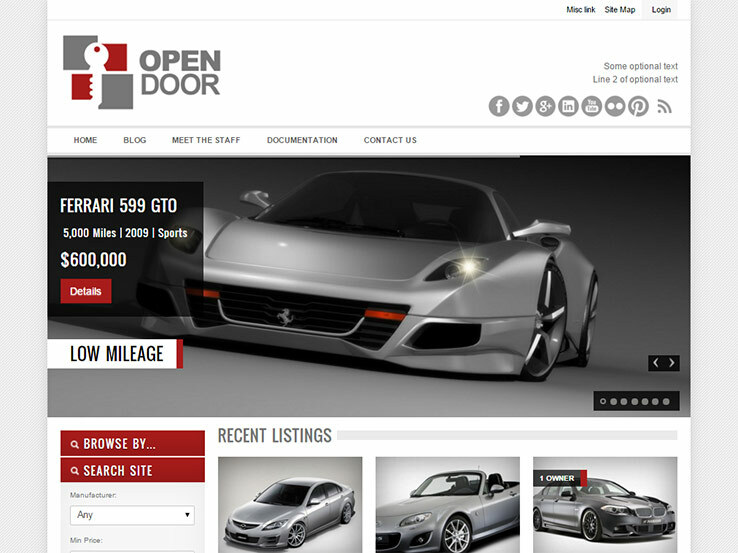 OpenDoor helps you to open new doors and opportunities for your car dealership business. The premium quality template offers multiple slideshows to showcase your latest collection. Visitors can use the advanced search and filtering methods to find out their desired vehicle. They will also find the comparison, related listings, and loan calculator very useful. It is possible to enhance the vehicle description by adding videos, while the robust options panel will let you customize the website style. You will find lots of widget-ready areas to utilize the available widgets. 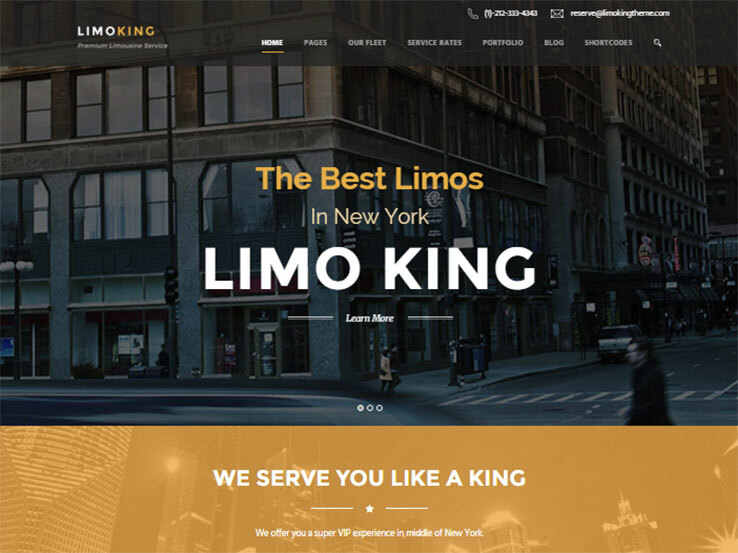 Whether you operate a limousine renting service or not, Limo King will be one of your best choices for building a car rental site. 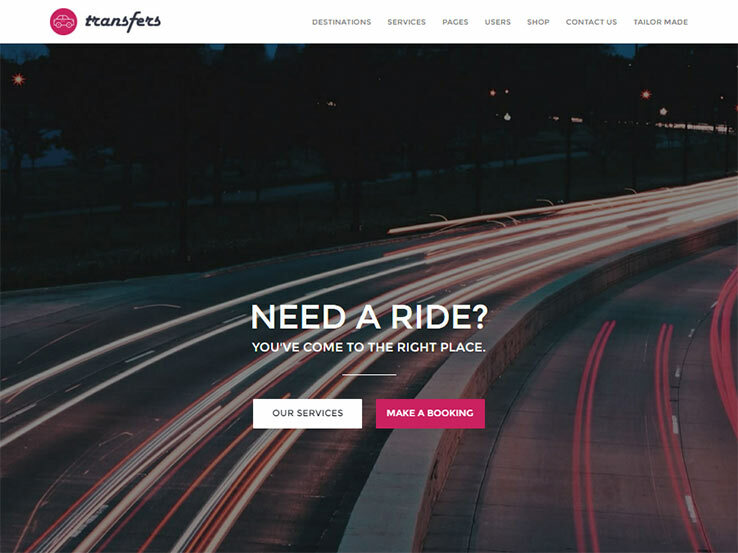 Its attractive fleet showcase layout will let you highlight the most popular vehicles, while the pricing table and the beautiful booking form will make it a lot easier for the clients to rent a car. Feel free to use the GoodLayers drag-and-drop page builder and Meta Slider to create gorgeous content pages. Limo King also enables you to display testimonials and publish blog posts in six different styles. 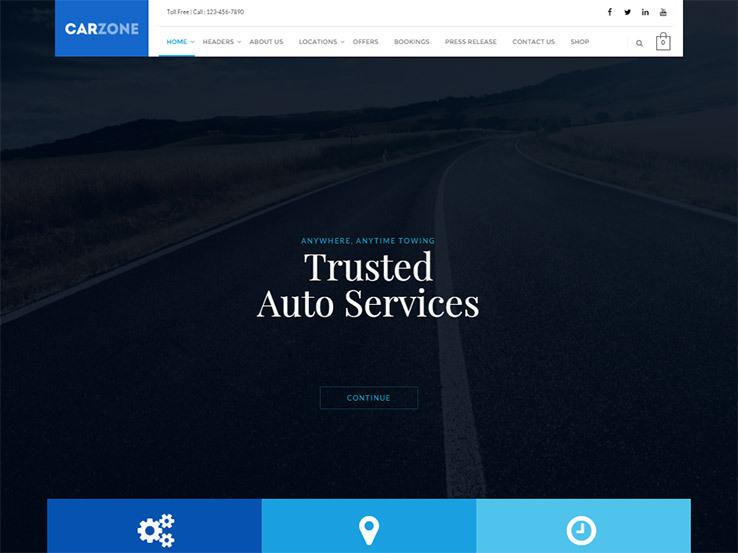 The clean, professional layout of Carzone is perfect for building your auto towing and repairing website. It features a robust booking system so that the potential customers can book your services in advance. Complete support for the Business Hours Pro plugin will let you display the regular business hours. Choose any of the five header styles and use the sticky bar to spice up the header section. With custom sidebar positioning, the widgets can be displayed on any side of the page. What’s more, Carzone also supports individual page backgrounds and all FontAwesome icons. With multiple CTA buttons on the hero image followed by a booking form, Transfers is entirely focused on converting your visitors into paying customers. It allows you to offer unlimited destinations with different vehicle types. Interested visitors can use the built-in availability checker and booking options to rent any of the available cars. Thanks to the advanced pricing plans, you can set up separate pricing for the shared, private bookings, and choose to apply surcharges. Multiple payment gateway support, inbuilt testimonials, FAQ, and social media sections will improve your overall conversion rate. Fix & Ride is all about helping people by fixing and repairing their rides. Get started by choosing any of the ready-made home pages or create personalized layouts. The integrated Essential Grid plugin will let you set up eye-catching galleries and slideshows, while multiple header styles and the beautiful hover effects will enhance the overall user experience. Interested clients can use the AJAX search and inbuilt booking system to find and book the necessary services. As the template works correctly with WooCommerce, it will be a lot easier for you to deal with the payment, tax, discount, and other business issues. 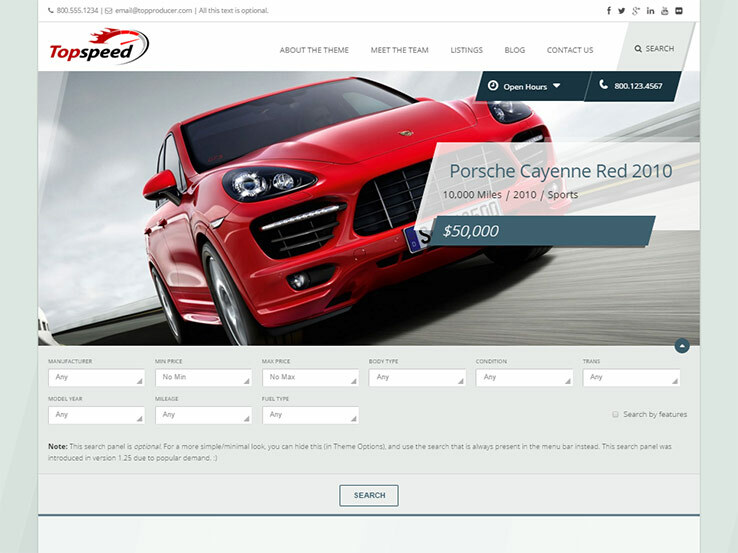 The fabulous Top Speed theme comes with a stylish slider to highlight the selected items with their price, type, year, and mileage information. Using the header on top of menu bar can be an excellent way to inform the audience about the latest updates, events, or promotions. Customers can search by specific models or use the powerful filtering options to sort out the available items. They can compare multiple listing and check out the relevant items as well. Thanks to the dedicated mobile navigation and social sharing plugins, your visitors will enjoy a superior browsing experience. 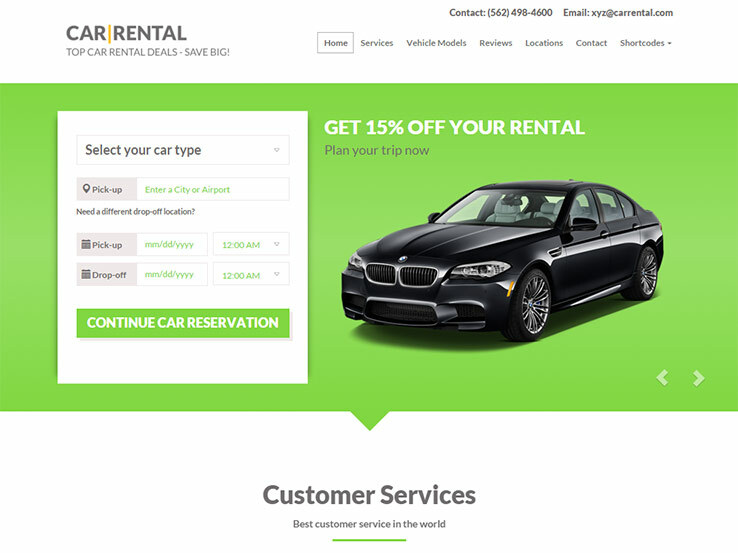 The one-page Car Rental theme welcomes the audience with a car reservation form along with an attractive image slider. Its highly powerful visual drag-and-drop builder allows you to create any layout you want. Built-in extensions for SEO, analytics, and data backup will ensure that you don’t have to use third-party plugins. Complete Google Maps support and the stylish contact form will offer multiple modes of communication. Other notable features include unlimited colors, CSS3 animations, MailChimp integration, one-click installation, mobile-optimized interface, and SEO-friendly coding. 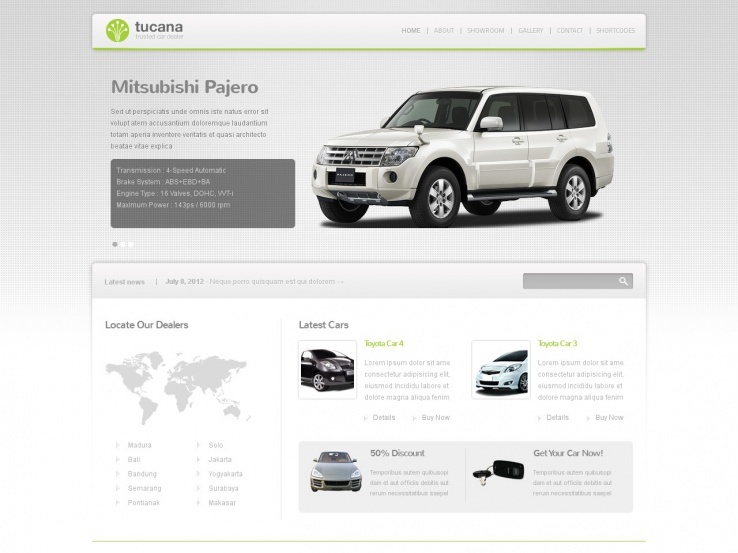 Having a simple white-gray color scheme, Tucana is all about simplicity. It has multiple home page variations so that you won’t have to be limited to the same layout. Thanks to the custom post types, it is possible to publish different types of content. Dynamic image resizing will take care of the image cropping issues. Decorate the regular pages by applying the user-friendly shortcodes and widgets. The AJAX-powered contact form and threaded comments will encourage the visitors to join the conversation. In case you don’t have the time to set up the site, you can get started with the XML sample data. If you have a brand color for your car service and workshop business, Mechanic will help you use that color throughout the website. The inbuilt Visual Composer, Mechanic shortcode generator, and the flexible header and navigation choices will be incredibly useful for creating custom content layouts. Use the unlimited sidebars to set up as many sidebars as you want, while the live customizer panel will provide you with a robust set of styles. Don’t have the time to get started right now? Use the sample content or take advantage of the prepackaged under construction page. 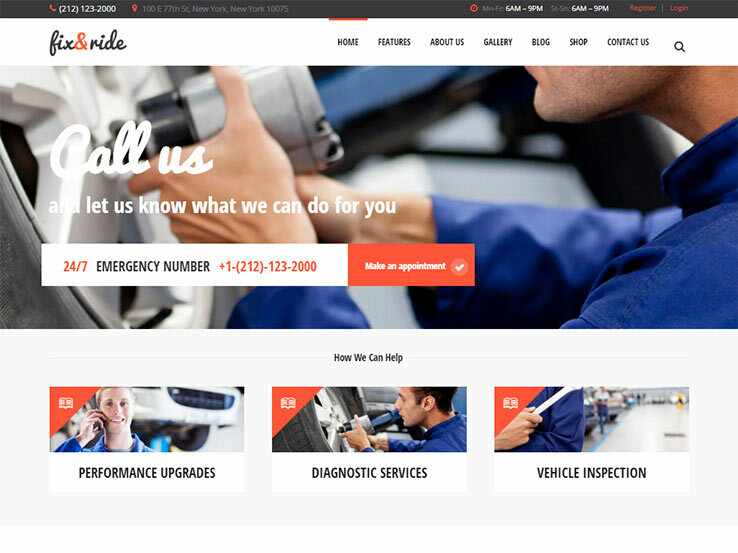 AutoRepairShop uses several bright colors to help you set up a trendy car mechanic and auto repair website. Its multi-level drop-down menu enables you to include the necessary navigation items. The superior options panel will be the best place to make the necessary customization changes. The integrated content modules along with the ten custom widgets will allow you to build unique page designs. As the package includes the layered PSD files, customizing the outlook won’t be a problem. It is also possible to import the included demo data with a few clicks. AutoDoc comes with a diverse range of components to help you set up auto repair, mechanic, garage, or car wash websites. It offers a couple of professional front page iterations, while the favorite combination of Visual Composer and Slider Revolution makes it possible to create your own layouts. You will find the live customizer very useful for making various style changes like choosing any of the four built-in color skins, taking your pick from the 600+ Google Fonts, and utilizing the visual CSS style editor. Full WooCommerce integration will make it a lot simpler to run your virtual service shop. Carell places the car searching option right under the featured car section, making it clearly visible to the audience. The customizable search fields allow you to choose which searching methods your visitors can use. Add more details about the vehicle by using the custom fields and build unique pages with the included Visual Composer plugin. There are several additional widgets to help you customize the sidebar, footer, and other supported locations. Thanks to the integrated loan calculator, potential customers can estimate the budget. Feel free to show the under construction page until you get the full site ready. 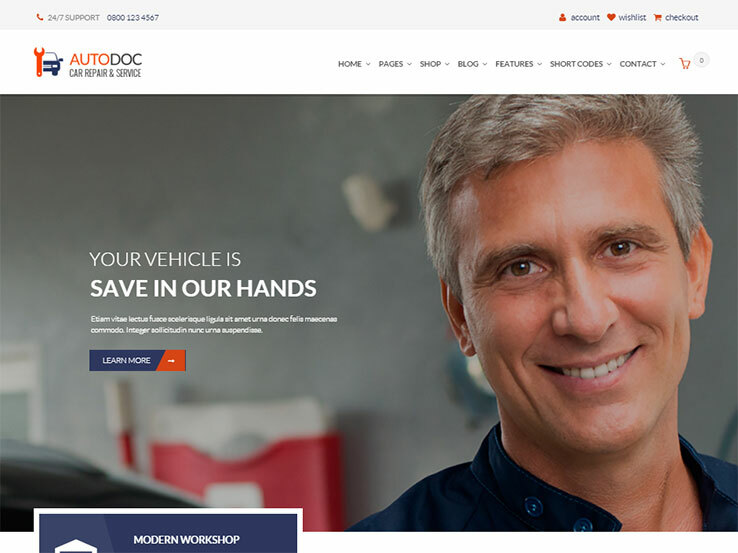 As you can guess from the title, this is a dedicated auto repair, mechanic shop, and workshop template for WordPress. 456 Repair brings several header variations with 3D mega menu support for enhancing the user experience. The inbuilt table manager will let you create table-based content layouts with a few clicks. When using this theme, you will get unlimited access to nine premium plugins for adding more features to your website. It will be a lot easier to highlight and manage the available services by using the catalog mode and customized WooCommerce support. It doesn’t matter whether you are offering limousines or not, Limousine Services should be one of the top choices for creating your luxury car rental site. The multi-level drop-down menu will make your website easy to navigate, while the dedicated services section will keep the clients informed. There are several professional styles for displaying the available collection. Thanks to the integrated temples, the service and contact pages can be set up within a few minutes. Also, don’t forget to use the 80+ shortcodes and the additional widgets to spice up the posts and pages. 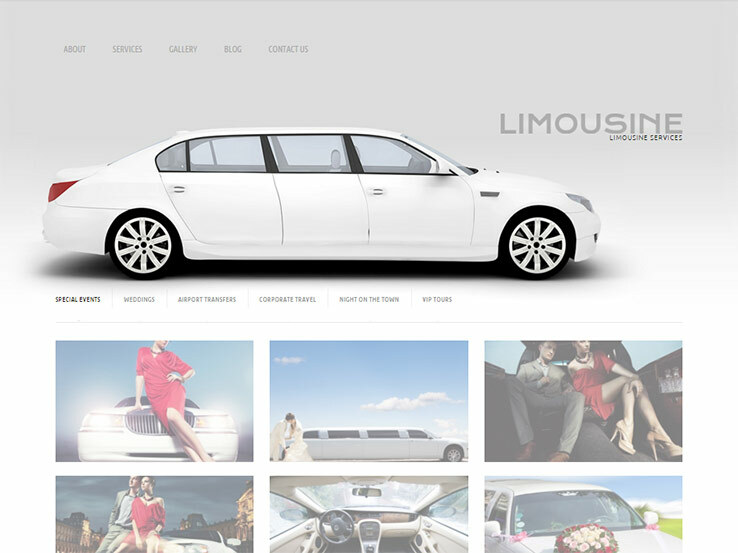 Here’s another car rental WordPress theme that is suitable for both limousines and regular vehicles. 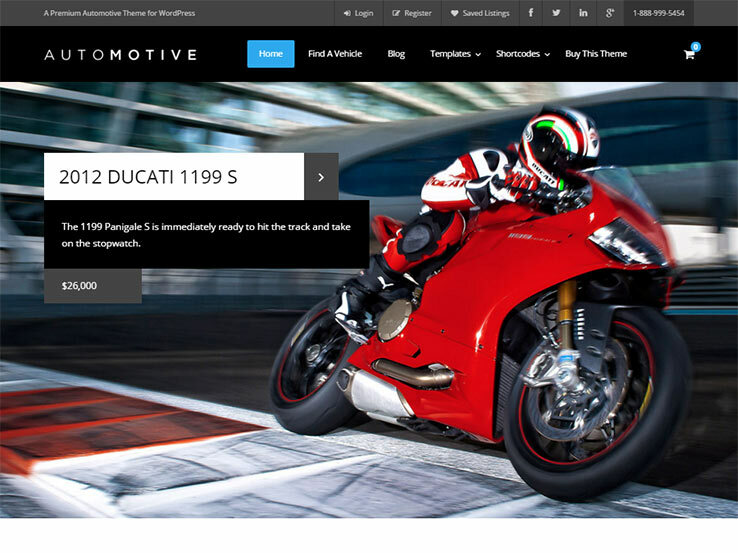 Its attractive home page starts with a hero image to put the primary focus on the latest or most popular vehicles. Below, customers can check out a filterable collection of the available luxury cars they can book right now. Thanks to the multiple display styles, you can show off your fleet in different ways. Dedicated designs for the contact, testimonials, and FAQ pages will let you get started quickly. As the template supports all Google Fonts, you won’t have to worry about the typography aspect either. Octane’s full-screen slider allows the customers to check out your latest automotive collection in its full glory. The drag-and-drop builder will let you create any post or page design you want. The sticky header and mega menu support will ensure that the visitors can easily explore the other parts of your website. The integrated car dealership plugin will provide you with the necessary admin options, while the inbuilt contact form will be beneficial for the interested clients. Feel free to use the one-click installer feature to replicate the demo content on your site. 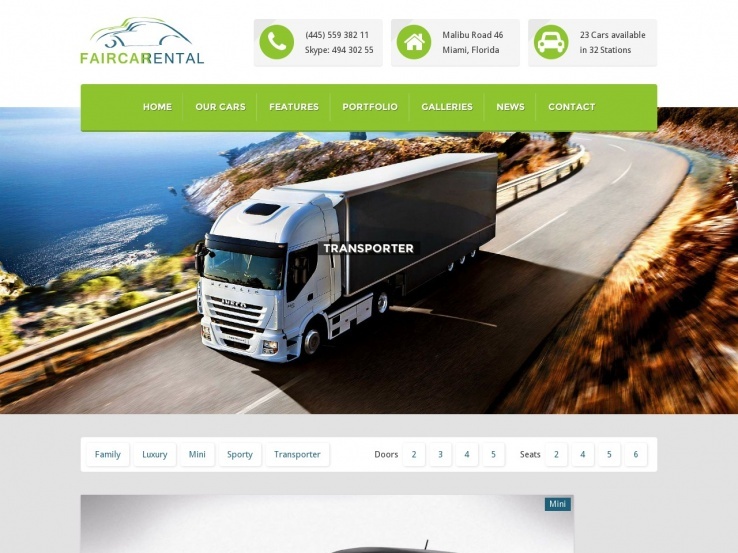 Looking for a minimal WordPress template for your car rental website? 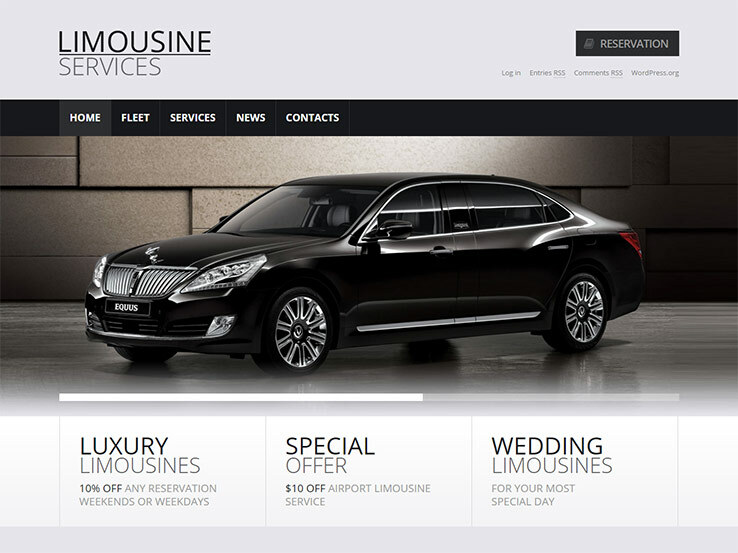 Make sure you check out Luxury Limousine Services, an exceptional theme that makes heavy use of white spaces. Its specially styled navigation menu supports multi-level drop-down items, while the gallery page is offered in four different styles. Built-in layouts make it a lot easier to create the necessary pages. Take full advantage of the 80+ shortcodes to decorate the posts and pages with additional elements. The customizer section holds all the color, typography, and other styling options. Auto Image should be a top choice when you want to impress the audience by displaying stunning animations and HD images on your car dealership website. As it sports a one-page design, potential customers can have a complete overview of the services from the same page. The dedicated items section enables the visitors to check out the available vehicles and filter the collection. You will also find separate sections for displaying the team, short company information, testimonials, and so on. The contact section includes a contact form with address and working hours so that the clients can easily reach you. 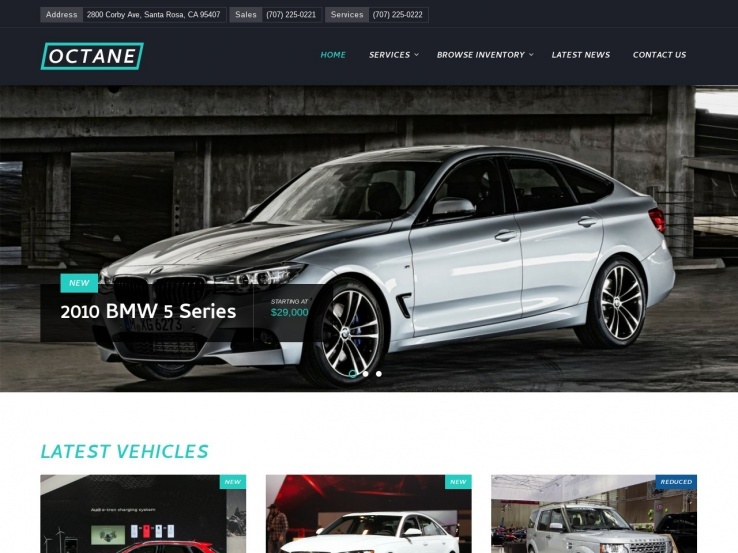 This grid-style WordPress directory theme offers all the usual options you will need to display your exclusive automotive line. The stylish hero section supports a video background to provide an overview of the collection. Thanks to the simple item submission facility, your team can easily add the latest arrivals to the website. The front page has multiple sections for displaying the available categories and selected items. There are several custom-coded plugins to enhance the default Listify options. The template also comes with multiple monetization options and amazing hover effects for your site. 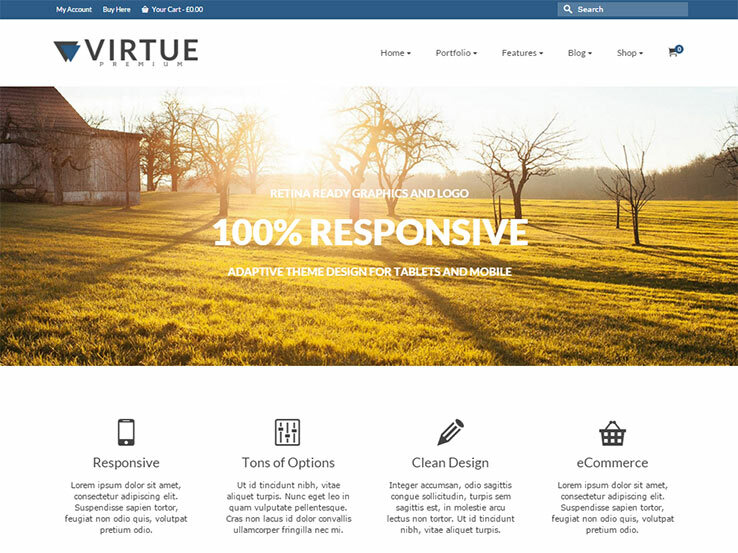 Virtue is one of those rare themes that can be used to develop an auto dealership, car repairing, or multi-purpose sites with both of these services. As the home page is developed with different modules and widgets, it is possible to construct new layouts according to your business needs. Several styles for the gallery and single items will come in handy to showcase your automotive collection or the services. Dedicated designs for the product, category, 404 pages, lots of custom widgets and shortcodes will make your job a lot easier. 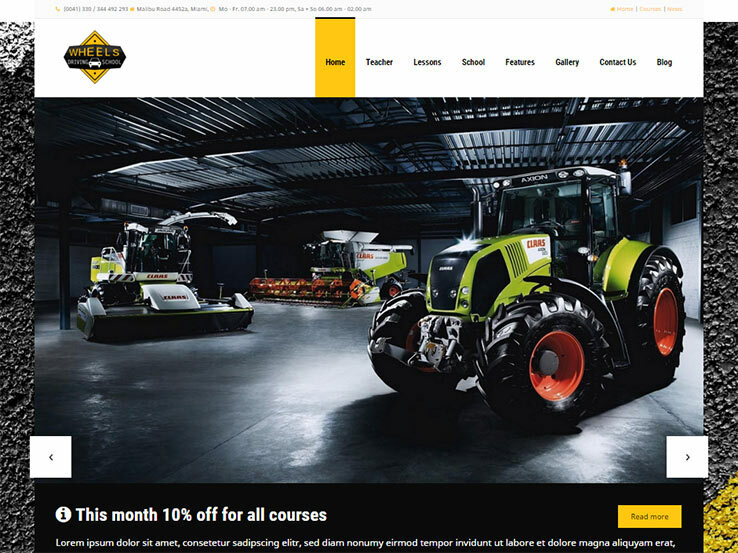 Being a popular multi-purpose WordPress theme, Industrial allows you to create beautiful looking automotive websites within a short period. It features a WYSIWYG content composer to help you design unique layouts. With support for multiple sliders, it won’t be a problem to show off your automobile collection with gorgeous styles. Built-in form builder and the king-size shortcodes pack will put together the basic website structure without using any extra plugin. Take it to the next level by making use of Industrial’s rich widget collection. The WooCommerce-supported template offers all the personalization options in the customizer section. The long, stretched front page of Faircar Rental includes dedicated sections for the cars slider, a grid view of the available models, categories, contact information, team, testimonials, news, and so on. Its AJAX-based booking form also includes an availability checker so that the customers can search and book their desired vehicles at once. As the rental prices vary based on the time of the year, you can set different prices based on the season. Having the option to apply custom CSS to the single post, page, and post type, you won’t have to fiddle with the core files anymore. Unlike the other themes mentioned here, this one is specially developed to help you develop driving school websites. It has special post types for adding instructor, classes, and locations to your site. Besides the drag-and-drop slider and social icons management options, Wheels also supports quick galleries for setting up and displaying attractive slideshows. The AJAX-powered admin panel enables you to browse and make style changes without reloading the page. Thanks to the dedicated options, it won’t take long to connect your site with Google Analytics and Webmaster tools. The quick install and demo content import features will come in handy as well. 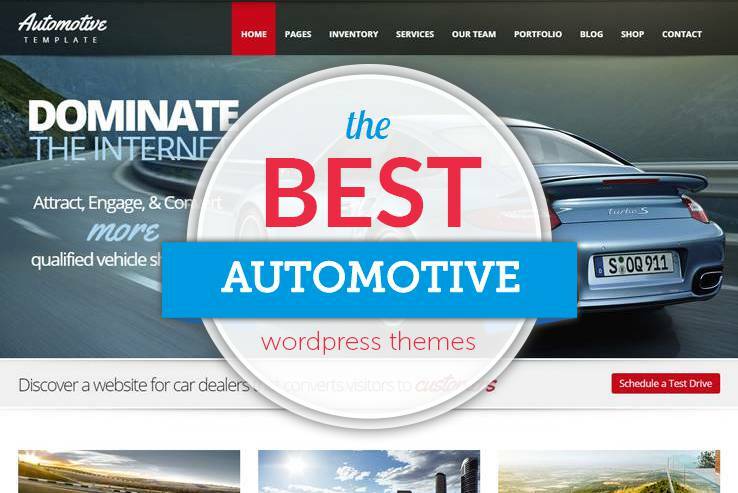 BeTheme is one of the most popular multi-purpose WordPress themes ever, making it an excellent choice for creating different types of automotive websites. There are lots of pre-built demos along with the option to use Muffin Builder for developing custom designs. You will also find 20 header styles for the desktop site and six variations for the mobile headers. 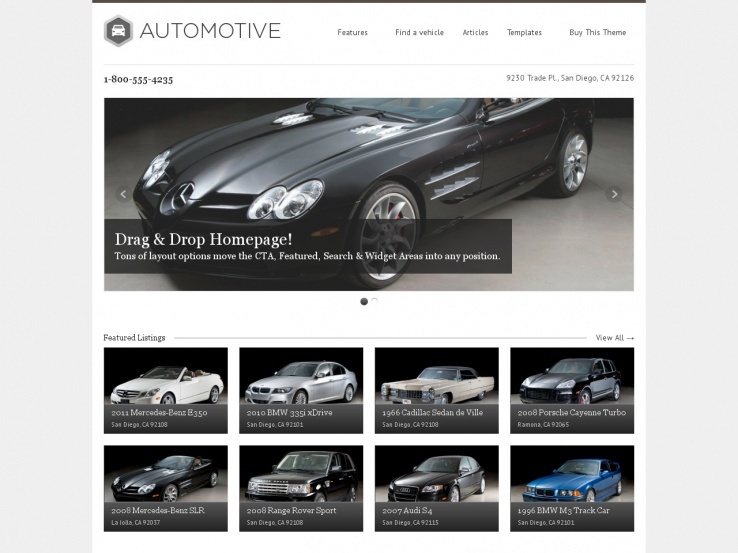 There is a built-in option to use BeTheme to create one-page automotive websites as well. Parallax effects and video backgrounds will make the sections or pages look more attractive. Feel free to check out the available Google Maps styles and choose one for your site. 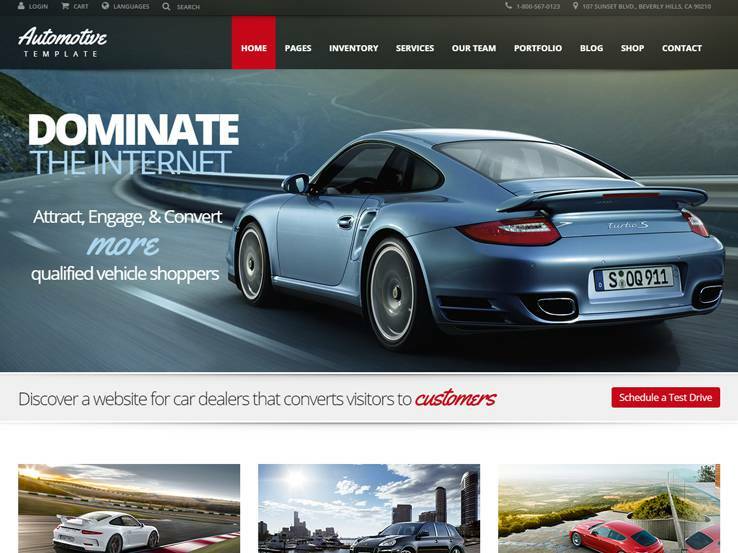 RT-Theme 18 is all about creating professional websites, making it a suitable choice for your automotive business site. It enjoys a unique combination of the template builder and multiple header styles to make your site look unique. Top-quality product showcasing options will help you to display the available collection. Enhance your posts and pages by using a combination of the premium icons, shortcodes, and additional widgets. The extended styling panel and the inbuilt dummy contents will make it a lot easier to get started and manage your site. 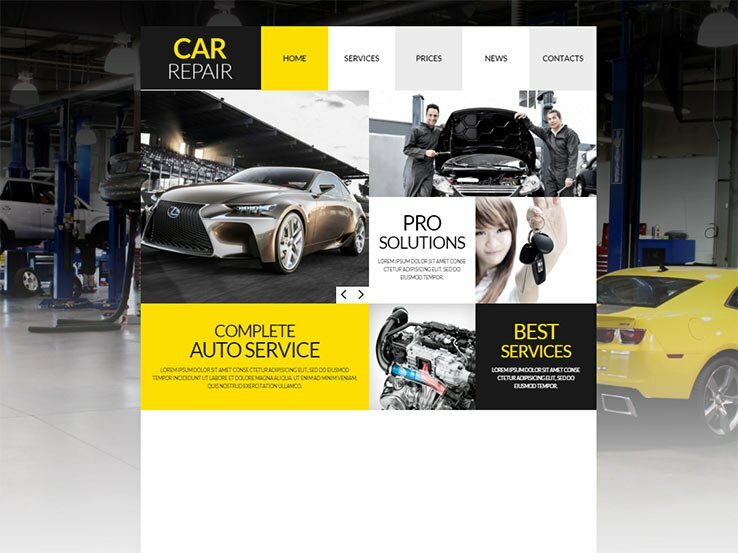 The beautiful design and bright colors of Garage will draw the attention of your visitors to your auto repairing website. It comes with the popular combination of Visual Composer and Revolution Slider for setting up amazing slideshows and content layouts. The self-hosted HTML5 video player will allow you to upload unique videos. Inbuilt social sharing buttons will help you to connect with your fans on various social media networks. Having support for all the Google web fonts, you can jazz up the typography aspect. Take advantage of the one-click demo import feature to get started quickly. BBold is a beautiful multipurpose theme packed with features and options that make it suitable for any type of niche. Because of that, it’s a great choice for auto dealerships who need great control over their website’s design. The header area allows you to include a stunning full-width slider where you can feature your most popular cars. Directly below, you can include a description of different types of rental services and plans you offer, along with a gallery of all your vehicles. Feature members of your sales team along with their profile photo and links to social media profiles and you can also include testimonials from happy customers. Parallax sections are offered as well so you can add visual appeal to your website without slowing it down. Use the available shortcodes to quickly add buttons, columns, and more to any of your pages and customize your typography with any of the Google Fonts. You can also choose from unlimited color options to incorporate your own brand and create any type of layout with the page builder, all without touching a single line of code. The theme is also responsive and you can even add video backgrounds to show off your cars in style. Try out the Automotive Ace theme if you want a website with AJAX loading. What does this mean? It means that your site loads quickly which is one of the ranking factors when it comes to search engines. Different homepage designs allow you to make a unique site and the responsiveness ensures that people are able to view your content on smaller devices. Awesome animations are provided and tons of shortcodes help you add anything from buttons to columns. The theme also includes a wide range of pages that go well with car dealerships. A loan calculator works well for customers who are looking into their financing options. A Vehicles page segments each of the items into categories. This means that people can search based on price, make, or model. Contact pages make it easy for potential buyers to get in touch with you and the blog allows you to share car buying tips with people who are just getting started with buying a car. The blog is also handy for boosting your search engine rankings, which is a must for car dealerships who are competing with other businesses in the area. 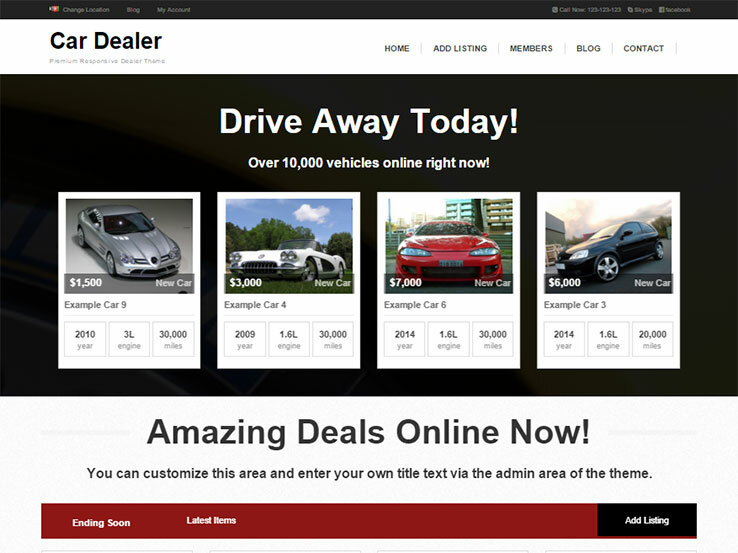 The Car Dealer Theme is a great choice for car dealerships, classifieds, and vehicle portfolios. It features three different demo layouts, which give you a nice starting point for your design. 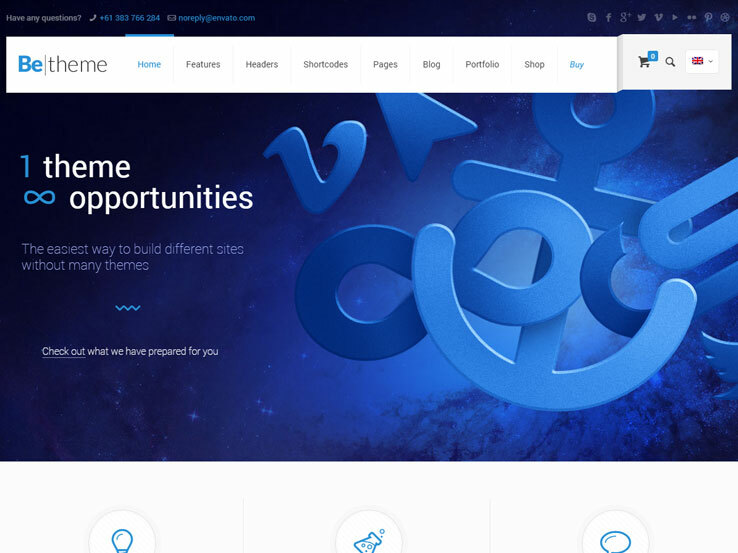 This is a completely responsive theme and it comes with over 100 admin options for customizing your site to your liking. Free and paid memberships are available so users can come to your site and sign up for more exclusive benefits. The one-click installation is a nice touch and over 20 payment gateway options help with collecting payments and showing people that they can buy cars through your site. For those classifieds sites out there, a location and distance tool is provided for your users to find the most relevant cars in their area. Advanced search and custom fields ensure that people don’t get confused while searching for cars and users can even add their own cars to be sold on your marketplace. The members’ area is great for people to keep track of the cars they have looked at in the past. There’s even a messaging center to facilitate the communication between sellers and buyers. Contact forms are nice for keeping in touch with potential clients and the drag-and-drop homepage layouts require no coding knowledge to be modified. Change the fonts and colors easily and upload any type of media including images, music, documents, and videos.